Our Ice Cream cakes are in high demand at the jersey shore. They are made with our Welsh Farms 10% soft serve ice cream. 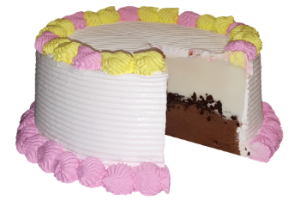 Traditional ice cream cakes have one layer of vanilla and one layer of chocolate with cake crunch in the middle. Feel free to call us or stop by to order the size and colors you need. You can also customize the ice cream flavors, toppings and design. We will always try our best to go the extra mile for you and your loved ones!